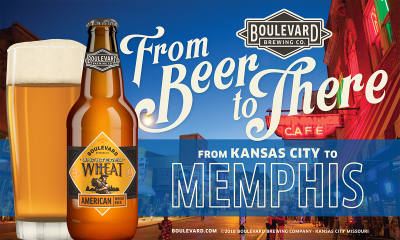 April 2, 2018 – Kansas City – Boulevard Brewing Company today announced that its beers will soon appear on shelves and taps in greater Memphis and northwest Tennessee. The Kansas City brewery expanded to other areas of the Volunteer State last spring; with the appointments of Eagle Distributing, Central Distributing and Volunteer Distributing, Boulevard beers will now be available statewide. Many of Boulevard’s most popular beers will be available beginning in April, including Unfiltered Wheat Beer, Jam Band, Tank 7 Farmhouse Ale and Tropical Pale Ale, along with a variety of seasonal and limited releases. Boulevard will be pouring several beers at the Memphis BrewFest on April 14. Details on additional launch events and retail locations may be found on Boulevard’s website and social media outlets.